(CNN) Joaquin “El Chapo” Guzman arrived at a Long Island, New York, airport with tears in his eyes. The once-powerful leader of the Sinaloa drug cartel was accustomed to being flanked by bodyguards. But in January 2017, he was escorted by federal agents — one from Homeland Security Investigations and the other from the Drug Enforcement Administration. Guzman’s arrest in Mexico a year earlier and extradition to the United States was the culmination of a nearly 30-year investigation and hunt to bring him to justice. The criminal mastermind who once bragged about his ability to evade capture and even shopped a biopic about his life to filmmakers looked around in wide-eyed confusion as agents ushered him into a black SUV. Guzman arrives in New York in January 2017 after his extradition from Mexico. 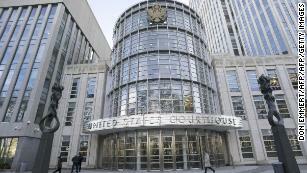 Guzman’s trial was at the US federal courthouse in Brooklyn, New York. 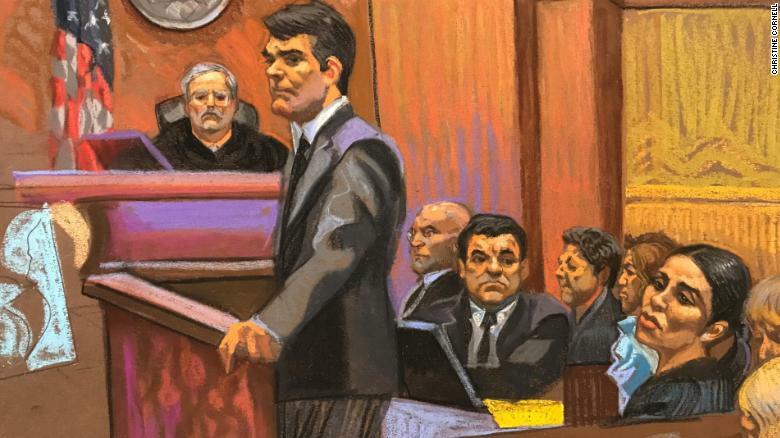 Guzman’s long-awaited criminal trial began in November in a New York federal district court with unprecedented security measures. Guzman pleaded not guilty to 10 counts, including conspiracy to launder narcotics proceeds and international distribution of cocaine, heroin, marijuana and other drugs. Testimony at the 12-week trial was often dramatic and sensational, exposing in detail the lengths to which Guzman went to build his empire and kill his way to power. More than 50 witnesses, many of them law enforcement agents, delivered some 200 hours of testimony. In the end, a jury on Tuesday found him guilty on all counts. A sketch from late last year shows the former drug kingpin seated in a suit and tie. The story of how Guzman escaped from two maximum security prisons in Mexico before being flushed out of hiding and arrested by a coordinated team of US and Mexican agents has already been made into documentaries, made-for-TV movies and even a Netflix series. But Donovan, who oversaw the multi-agency effort that finally brought Guzman down, tells the story from an entirely different perspective. In 2001, Guzman escaped prison by hiding in a laundry cart. He was not apprehended again until 2014. The following year, Guzman escaped again. This time he crawled through an opening in the floor of his shower into a tunnel. That’s when Donovan huddled with Mexican officials to figure out who was responsible for the escape and, more importantly, how to recapture Guzman. Investigators knew about possible safe house locations in Los Mochis, a city in Sinaloa. Mexican marines went to ranches surrounding his birthplace in nearby Badiraguato, hoping the added pressure would draw Guzman out of his hiding place and force him to flee to a safe house. The Mexican marines didn’t know which of the possible safe houses Guzman might pick, but they had eyes on them all with 24-hour surveillance. On January 7, 2016, investigators saw Guzman coming down from the mountains, Donovan said. He took one truck, moved to another truck and ducked into a safe house that had been identified weeks earlier, according to Donovan. Hours later, law enforcement made their move. Once again, Guzman tried to run, this time through a trapdoor in a closet that led to a sewage tunnel underneath the safe house. Law enforcement had done reconnaissance on the home and knew about the tunnel, which was full of water at the time. They followed Guzman, but now, many had to stay behind to fight and capture members of the drug lord’s security detail that included some of the most dangerous killers in Mexico. Meanwhile, Guzman was running with his most ruthless assassin by his side: Cholo Ivan. Ivan carjacked a taxi driver at gunpoint and sped away in his vehicle. The driver flagged down a fellow cabbie and moments later, law enforcement heard the driver get on the radio and tell others he had just been carjacked. Guzman and Ivan decided to ditch the cab before police realized who they were and find a new escape vehicle. They picked a car driven by an elderly woman and her grandson, which they also stole at gunpoint. But before they could take off, they realized the engine was smoking and the car wouldn’t run. By then it was too late. Mexican federal police, who saw the second carjacking take place, raced over and captured the pair. 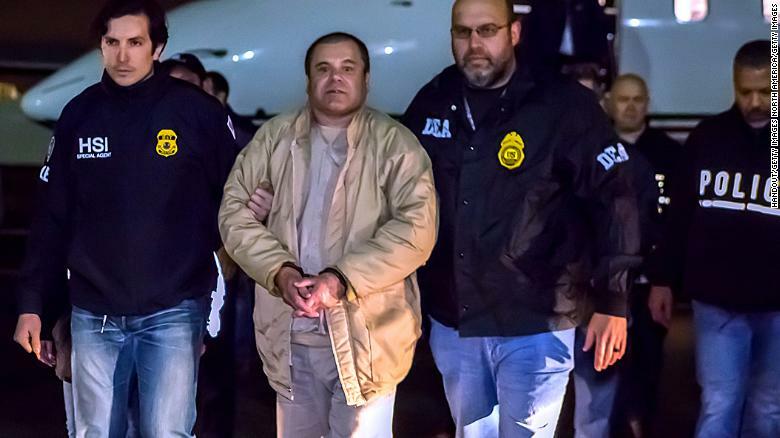 This image provided by the Mexican government shows Joaquin “El Chapo” Guzman after his capture in January 2016. Mexican marines, who also heard the altercation on their radios, raced to the location but did not find anyone. A tow truck driver pointed them to a nearby motel, where they found the federal police, and both Guzman and Ivan, in custody in one of the rooms. 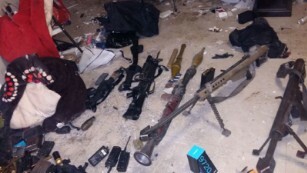 Mexican authorities provided this image of weapons seized in the raid to recapture Guzman. Donovan said Guzman was the brains and the muscle behind the Sinaloa Cartel. And while there are others also on their list, Guzman was the one who wanted to go to war with the other cartels, fighting for control of drug routes that led to the United States. He also said Guzman was the one who pushed to lace heroin with fentanyl, a synthetic opioid that is common in drug overdoses, according to a report in Decemberfrom the Centers for Disease Control and Prevention. Guzman told his dealers to give the highly addictive drug away in order to hook people.